An expedition from the Boston area arrived in 1636 led by Colonel John Endicott. 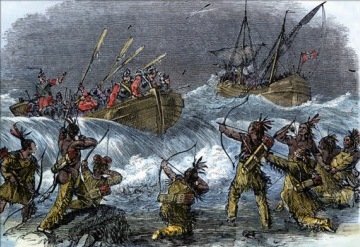 Due to this event, the island initially became part of the Massachusetts Bay Colony, which in 1658 granted it to a group of four men headed up by Endicott, who had led the expedition. They were avenging the death of Boston trader, Captain John Oldham, who unfairly traded sacks of sand instead of grain to the Manisseans. This event also was used to start the King Phillip War. In 1660 the island was sold to sixteen the purchasers and settlers. Their names are listed on a commemorative rock on the north end of the island where their shallop came ashore and where they named “Cow Cove” for the cattle they brought and which swam ashore at this location.